1. a conclusion or resolution in the mind as a result of consideration. The 99 Decisions Guitar Course is a collection of 99 individual video lessons that have been designed to take you from a complete beginner to a fully-functioning guitar player. Each lesson represents a choice on your part to apply yourself towards the goal of learning to play music... while having fun! 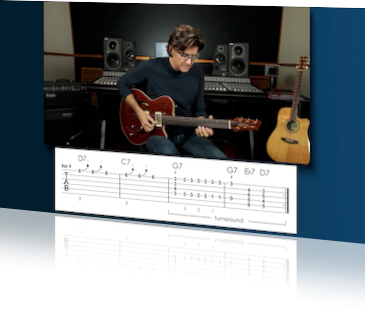 The lesson videos, ranging from 2 to 18 minutes, make for over 8 hours of instruction & cover all the musicianship skills that you need to play the music that you love… in any style or genre. The 99 Decisions Guitar Program isn't just for beginners. Experienced guitar players can expand their musicianship skills & increase their knowledge by focusing on lessons covering the specific areas that they need to improve. There is an integrated concordance & index that will help you create your own personal guitar agenda. an exercise to improve the technique or demonstrate the skill of the player. 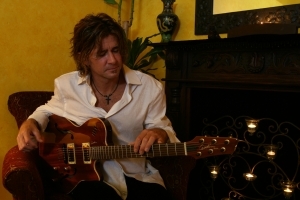 The best way to become an accomplished guitarist is to learn complete songs. Apply the skills you have learned in the 99 Decision Guitar Program with a series of original etudes. Designed to accelerate your growth in becoming a functioning musician, they are included in your 99 Decisions membership. 2. a reward for good performance. The bonus lessons complement the 99 Decision Guitar Course. 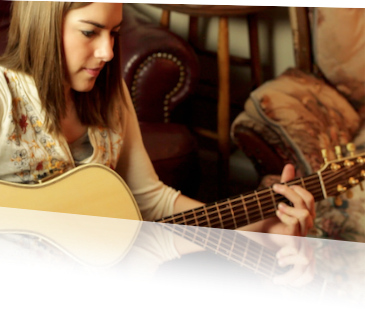 They're designed to broaden & deepen your musicianship skills, taking your guitar playing to the next level. 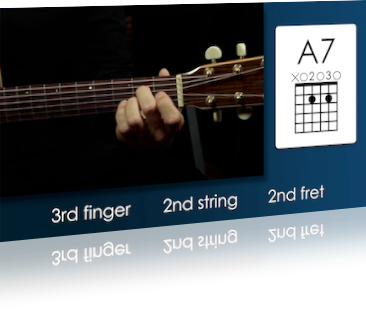 Each extensive bonus lesson focuses on a specific topic: advanced chord technique, building rhythm skills, beyond the basic chords & ways to play scales. Soon, you’ll be sounding like the guitar players you admire, playing the music you love. Progressing on the guitar is about more than just getting your finger on the correct string & fret, or strumming the correct pattern. It is about the integration of Mind, Body & Spirit. The Fulfillment Factor video discussions address subjects critical to becoming a well-rounded & confident musician. Topics include maintaining an effective attitude, staying goal oriented, keeping your body relaxed, building hand & finger strength, stretching, staying positive & motivated and more. The program includes seven video discussions with more to be added regularly. opinions, links to other sites, etc. on a regular basis. Regular weekly blog posts by 99 Decisions instructor Matthew Von Doran cover a wide variety of topics about the guitar & how to play it. Each week, Matthew will share helpful insights & techniques to accelerate your progress. Available 24/7, the 99 Decisions Community is a place for you to interact with other players so that you can share your experience on the path to learning the guitar & playing music. Matthew monitors all social media to ensure consistent thoughts & advice are offered on all things guitar & music. Do I have to finish all 99 lessons before I can play music on the guitar? 99 Decisions is designed to get you to where you can play basic rhythm guitar in about third of the way through. At this point, you could start playing any song that utilizes the techniques of playing chord progressions & strumming. How fast you get to this point depends on how much time you put in practicing the material in the lessons. The Etudes are songs that you can jump right into if you want. You’ll know if you are ready for them right away. Do I have to do all 99 lessons in sequence? Although this course is designed to be approached in a linear manner, it is also scalable... meaning the you can jump around & find lessons that focus on a particular aspect of guitar playing that you want to learn & practice. That way you can tailor it to your specific needs. There is a concordance/index in the back of the work book that group the Decisions by topic, as well as a general index. Does 99 Decisions teach how to play acoustic or electric guitar? Both! You can play everything in the lessons on either kind of guitar. Is 99 Decision for beginners only? No. 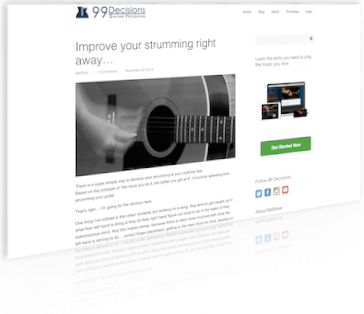 The great thing about the 99 Decisions guitar method is that it benefits players of all levels of ability. Although the lessons are designed to take you from complete beginner level to intermediate/advanced level, many guitarists benefit from finding specific 99 Decision lessons that focus on musicianship skills that they need to learn or improve. What musical styles are covered in 99 Decisions? Most of the musicianship skills that are addressed 99 Decisions are fundamental to all musical styles- Rock, Pop, Folk, Blues, Jazz, Reggae, Bluegrass... even Classical. It is always beneficial to lay a strong foundation when learning an instrument. That way, you can pursue learning the details of any kind of music. What age level is the 99 Decisions designed for? This course is appropriate for almost any age. Younger children would need to be assisted by an adult, who could actually learn the guitar along with the child. Do I need to learn to read music in order to learn to play the guitar? No. 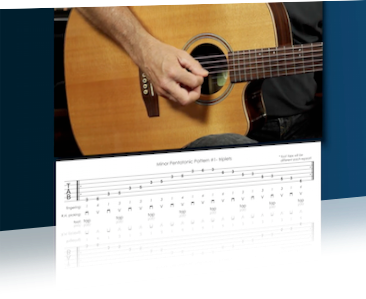 The 99 Decisions course uses standard chord diagrams, neck diagrams and tablature to demonstrate the chord & scale vocabulary and musical examples. Plus, all lesson examples are demonstrated in the videos. For a one-time fee, you will have access to all video content, as well as any live online webinars. New content is added regularly. Can I download the videos, backing tracks, and the workbook? You have 24 hour access to all lessons & content on the website but you cannot download any of the videos. You, can, however, download the PDFs & the backing tracks. Email us if you need any assistance. Our goal is for you to be 100% satisfied with The 99 Decisions Guitar Program. If you are unhappy for any reason, simply contact us for a prompt refund. Matthew Von Doran is an artist, musician, performer & educator with a vast background in the music industry. 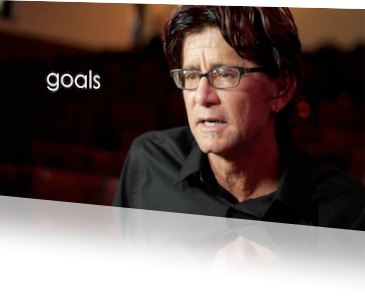 He has been assisting people in achieving their goals for over three decades. He has a strong passion for teaching guitar & is dedicated to helping students learn to play music & have fun in the process. With over 30 years of music teaching experience, Matthew has created hundreds of personal curriculums for students seeking to grow as musicians. Matthew also helps people develop their life skills- mental focus, goal oriented processes, effective mindset, time management, total body awareness & cognition. ~ Released the acclaimed Modern Jazz album of original compositions, In This Present Moment, featuring Jimmy Haslip, Peter Erskine, Larry Goldings, Bob Sheppard, James Genus, Terri Lyne Carrington, & more. Matthew would like to extend a special thank you to the Sheldon Theater in Saint Louis Missouri, for their support & encouragement. Also, one more huge thank you to Lab 1500 in Saint Louis for their positive energy & help.